I had mentioned in the comments section of my Mothman post that my mother was obsessed with owl imagery when I was growing up. 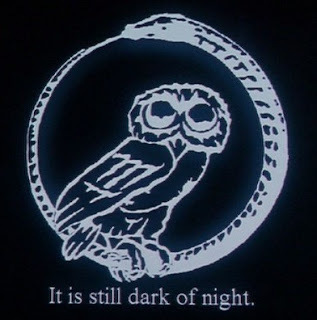 An anonymous commenter mentioned something that I had forgotten; that in alien abduction literature, owl imagery is often implanted into abductee's memories as kind of diversionary screen image. I do remember reading about that in either Communion or Intruders. Here's just a small sampling of the owl imagery I grew up surrounded by. That's me, in a corner of the dining room, probably sometime around 1972 or 1973. 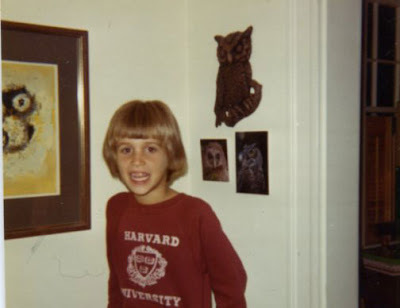 Most of the imagery was in the living room- there was a kind of alcove set into the wall that my dad used as a bar and then my mother used as a kind of shrine, with all kinds of owl figurines there. Later we put the TV there. That was the same exact spot I had the leprechaun hallucination you're all so sick of hearing about. I sometimes wonder if the neighborhood was once an old Indian burial mound. A couple years back a dolphin beached itself in the river right down the street. A fresh water river, mind you. 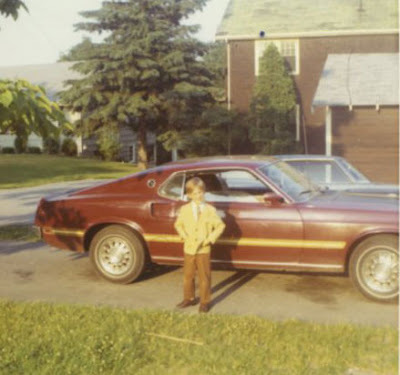 But what the owl discussion really reminded me of was my dad's Mustang Mach I. One of these days I'm going to get me a Mustang. Maybe when the midlife crisis hits. UPDATE: Obligatory Ten Thirteen reference.